I just had to share Jessica's birthday present. The beautiful yarn was gifted to me by a friend (I love it when people give me yarn!) and when I saw it I knew exactly who needed to have it in her life...Jessica. She use to have an orange sofa in NYC and her beau isn't a fan of the bright furniture so I thought this was a great way to throw a little color back on her sofa and keep Greg happy too. Normally when I knit or crochet I watch Tv/movies. And I did with this project too but before starting I would take a moment to dedicate my stitches to Jessica, to our friendship and the first 5-10 minutes or so I would meditate on that while crocheting. It was an amazing experience. 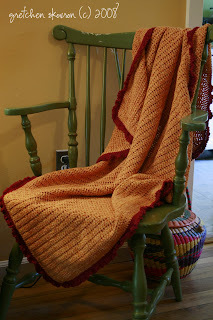 When we were moving from Seattle to MD and Jon was already on the east coast and the kids and I were in Seattle trying to sell our home, all of my craft stuff was already shipped but I saved a bunch of odds and ends of yarn to knit a blanket. I called it "the moving blanket". And every night I would work on it and pray that this move was the right move, that we would find what we are looking for, that we would be happy. I felt as though I was stitching those prayers in with the yarn. Logan has now adopted "the moving blanket" and it has permanent residence on his bed. I'm going to try and make a point to incorporate this type of meditation into all of my crafting work. If you plan on making gifts this year, take a moment to quiet the rush inside of you and honor the person you are making this gift for, release a blessing for them. And in your heart when they open your gift you will know they are receiving more than a scarf/skirt or hat...they are receiving your best intentions for them. I Love...in case there was any doubt. It lives on the back of the futon and I curl up in it when Greg and I have movie night.